I haven’t managed to write up our November trip yet, but Mr. Karen and I are on day one of our next journey. This one will be much shorter, a mere day’s drive from our house in Idaho to my sister-in-law Kay’s in Washington. We got up early (for us) this morning in order to be here by dinnertime. Mr. Karen did much better with the waking up than I did … I slept through the alarm clock as well as him getting up and opening the drapes and blinds and washing up in the bathroom right off the bedroom. I only roused when he turned on the bright overhead light, and even then he said it took about a minute (in the dream I was having, I incorporated that as someone shining their cellphone flashlight directly in my eyes). We left our house pretty much on schedule, did a couple errands in the city on our way through, had calzones as big as our heads for lunch on the road (I didn’t finish mine, so have half a head left for a snack at some point), and decided on the fly to take an alternate route that would let us avoid Seattle and its traffic entirely, which worked out pretty well. 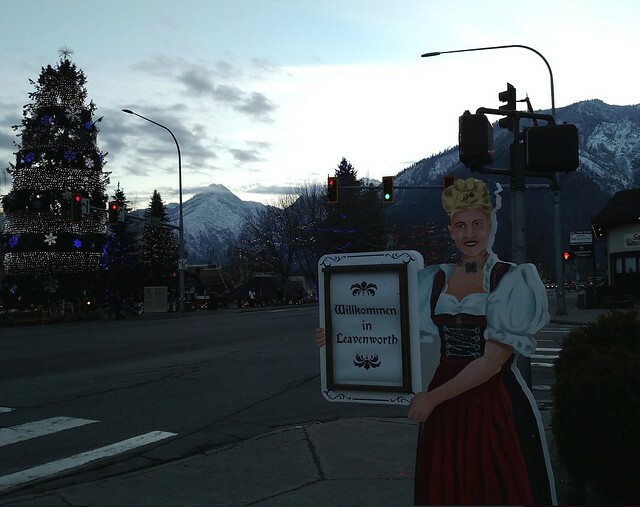 It took us through Leavenworth and their commitment to their Bavarian motif. We arrived safe and sound in time for dinner (no thanks to the SUV who cut over into our lane and nearly caused a crash; instinct and luck let me avoid him without any contact with his vehicle or anything along the side of the freeway). After fortifying ourselves with margaritas and Mexican food, we stopped by the storage unit for mother-in-law Joan’s things so we’d know where it was and how to enter the code to get in and then her apartment in the senior living community to visit for a while (she wasn’t able to join us for dinner). Now it’s nearly midnight and I’m tired and ready to go to bed. Still, it’s so nice to be at our destination in only one day’s driving, not two or three or four as most of our road trips go.